Leaving aside my Itinerary through Wales for a bit, let me explain what I have discovered so far on the possible area where Roger Vaughan grew flax in the area of Glasbury, Wales according to his petition for a bounty. I apologize if my panic spread to my wonderful collaborators back in the States. I was frustrated that the document I long believed was in the archives actually was and did not give any field names. We have field names on the tithe maps of Wales now digitized. So let's pause for a moment and see what this document does tell us. First off, our Roger is identified as a yeoman. That means he was a property holder and a leasehold would be adequate property at a basic value. Second, the petition was made in 1790, but the application is for flax grown in 1783 and 1784. Roger appears to have been in serious need of cash at the time. He just had an unmarried daughter (Hannah/Joanna) give birth to a child, our John the B (1789-1851). 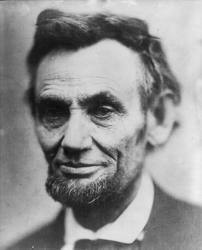 He may have been injured, infirm or too old to be able to work. He shows up in the Overseers for the Poor Account Book receiving payments beginning in 1786. I have not yet determined if the flax bounty was even paid. The Quarter Sessions Justices (County Gentry) approved the petition and it was sent off to the Exchequer in London for payment. Third, we do not have field names, but we have the names of the men from whom Roger leased the land for flax. John Jones is an impossible name to search in any corner of Wales. Morris is more unique. 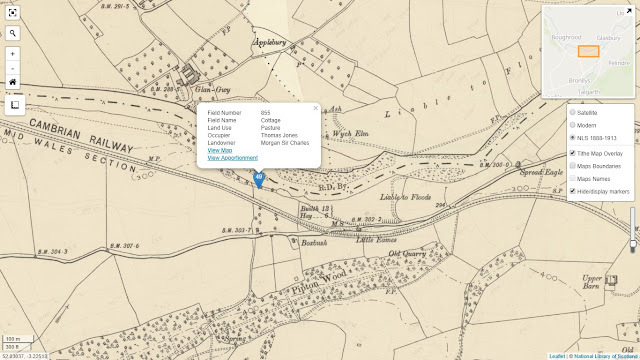 So what I did was search in Glasbury Parish on the Breconshire side of the Wye River for any lands owned or leased by a Morris (subleases upon subleases were possible). And . . . 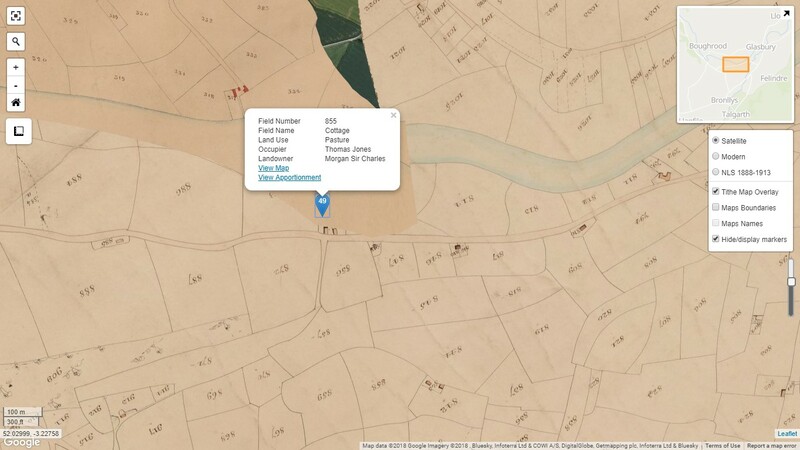 I did find several fields of a Morris family from adjacent Llyswen, just west and upriver from Glasbury. 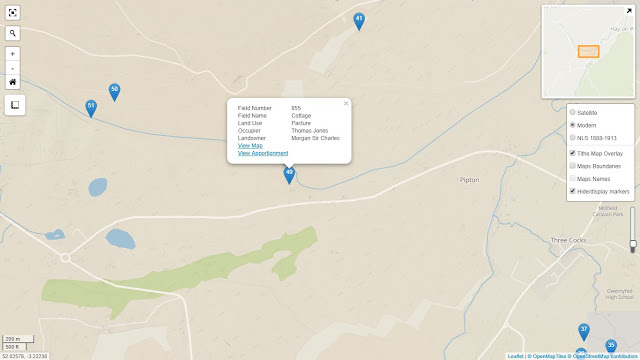 The family also appeared to have connections to the Whitney/Clifford estates just over the Herefordshire border. Some of the fields went into Glasbury Parish south of where the Wye makes a turn to the East coming out of the narrower valley from the North. 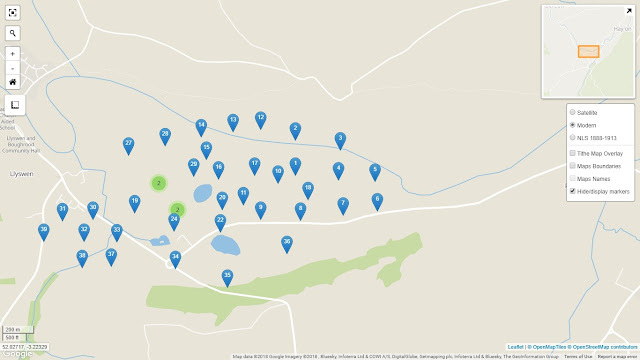 Blue pins are all Morris fields, south of the Wye, they are in Glasbury Parish. Here are the same pins in the Ordnance Survey overlay for 1888-1903. Same pins, different map. The railway is gone. The River Wye is pretty close to the same. And then we have the same, blue pins on an overlay of a modern map. 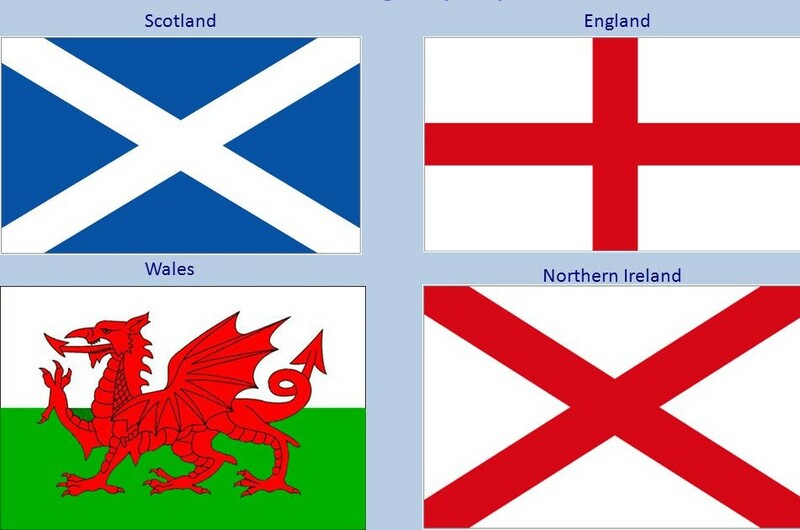 (The maps do not match up perfectly.) And this was is a slightly larger scale to show in relation to modern roads and the village of Llyswen. 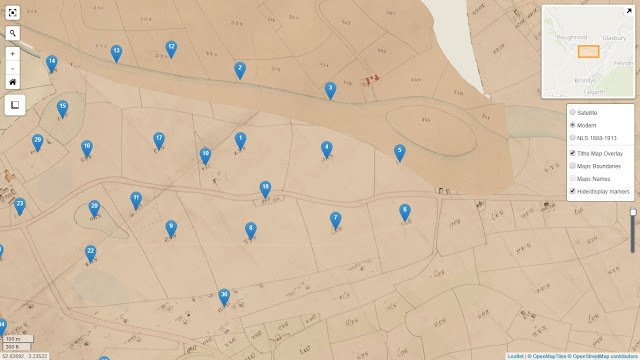 After I checked out the Morris lands, I wanted to see if there were any lands of a Jones that were close or even bordered any of the Morris fields. And, yes, it fits. The same sequence of maps follows with a blue pin for Jones. Matching up the maps, the fields of Jones and Morris are adjacent in the western portion of Glasbury Parish, south of the River Wye. Note that the Jones field also includes a cottage. This appears to have been destroyed by the railroad or the tramroad that preceded it. Note that here is a cottage named "Boxbush" that still exists. But the road is pretty much the same. And from doing these maps for the National Library, I am aware that they would have had a different parcel on the other side. And the modern map with the same, blue Jones pin. It is hard to believe that Pipton was a medieval castle of renown. Talgarth was a bit more important in the so-called Dark Ages. Such is the change of time. And what we have here, is a pretty good circumstantial case for fields that Roger could have farmed as evidenced by the petition for the flax bounty. With my trusty camera, I went out there this morning in the pouring rain (I'm sure Roger was well used to it). 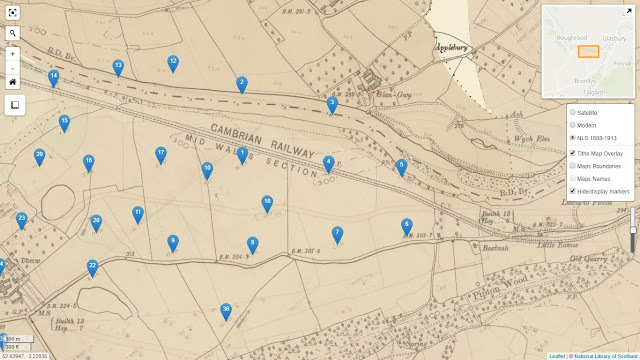 None of these are pinpoint locations, but there are in the general vicinity of where the Morris fields meet the Jones field between Llyswen and Pipton close to the Wye River. Looking northwest across the Wye. Looking pretty much westerly along the River Wye. This milestone marker is a pretty sure landmark in this area as it has been there for a while. I went back this evening after the rain had cleared and took a few more pics. The barn belongs to Boxbush, the house is just the other side. This is looking east towards Glasbury. Boxbush may go back that far and is a possible cottage for the Vaughans. Further work required. There is a fairly recent house just a bit farther up on that side of the road. That seems to be a good place to end this for now looking towards Glasbury. Hopefully, we can update with some info from Hereford Records Office and the Whitney/Clifford business. I'll go back to Bangor if I have to.